With the report of the Ministry of Injustice’s internal review of the employment tribunal fees introduced in July 2013 having now been sitting on the desks of justice secretary Michael Gove and his intellectually-challenged junior minister, Shailesh Vara, for seven months – three more than it took Ministry officials to ‘research’ and write the damn thing – there must be a chance that some kind of decision will be reached soon. Though as to what that decision will be, the omens are not good: not only has the Government stated recently that “it is too soon to consider whether any action is needed here” – in that case, why did they launch a review in June 2015? – but just last month the Ministry justified a whopping 500% increase in immigration appeal fees on the basis that, well, it has run out of dosh. Anyway, just in case, I thought it would be worth reminding ourselves what those with first-hand experience of the employment tribunal system since July 2013 said last autumn to the Justice committee of MPs, which was then busy inquiring into the impact of the fees but which now also seems to be encountering some difficulty in making up its mind and publishing its inquiry report. 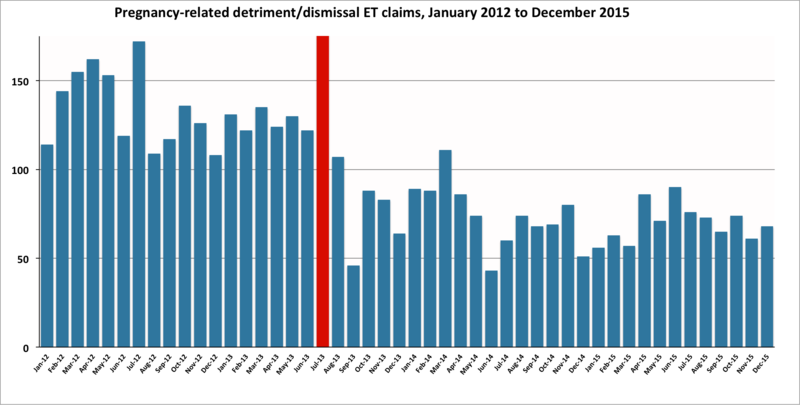 There can be no doubt that there has been a decline in cases presented to Employment Tribunals but [our members’] experience that there has been a particularly marked decline in the types of cases brought by ordinary working people – that is, claims for unpaid wages, notice pay, holiday pay and simple claims of unfair dismissal – is borne out by the statistics. The Council considers that there is clear evidence that fees are deterring meritorious but lower value claims, whether they be money claims, unfair dismissal or discrimination complaints where compensation for injury to feelings and lost earnings may be relatively low. High fees deter such complaints and act as a barrier to justice and, in the context of discrimination, undermine the aims of the Equality Act 2010. 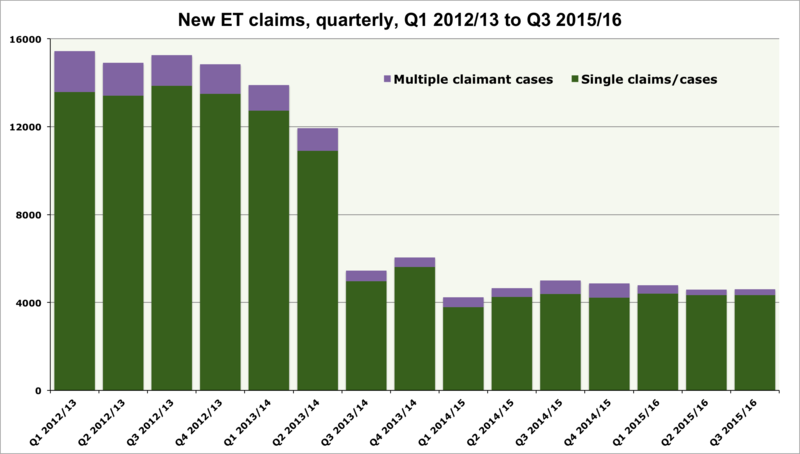 Fees have had no impact on weeding out weak claims: if they had done so the number of claims succeeding in front of Employment Judges would have increased significantly. [Our members’] experience is that misguided but determined litigants remain undeterred by the fees. We do not consider that there has been an obvious reduction in weak or unmeritorious claims. Had that been the case we would have expected the percentage of successful claims to have risen, whereas in fact it has declined slightly. In any event, the definition of what is a weak or unmeritorious case is notoriously elusive. In only a very small percentage of claims is it possible to identify an obviously weak or unmeritorious claim until there has been some rudimentary case management, a preliminary hearing or the determination of conflicting evidence. 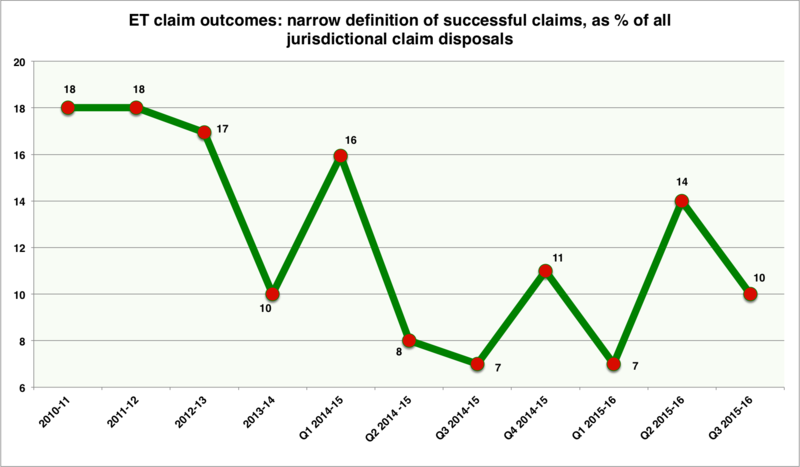 Given the dramatic reduction in the number of claims across all claim types, the information emerging from system users, and the difficulties identified [in this submission] in connection with the remission scheme (which was designed to maintain access to justice), it is the position of the Employment Judges in Scotland that the objective of maintaining access to justice – including ensuring that only those who can afford to contribute to the cost of running the system are required to do so – has not been met. Put another way, Employment Judges in Scotland consider the fee system has acted to significantly reduce access to justice. Camilla, pregnant and until very recently working 30 hours per week as a hotel cleaner on a zero-hours contract, contacted [our] legal helpline in 2015 after being summarily dismissed for taking time off work due to pregnancy-related illness. The helpline team considered Camilla to have a strong claim for unlawful pregnancy-related dismissal, but she was unwilling to risk up to £1,200 of her savings on issuing and pursuing a tribunal claim. Not without difficulty, Camilla had managed to save just over £3,000 to cover the extra expense she knew would come with having a baby – not least because she would receive only the statutory rate of maternity pay (just 60 per cent of the National Minimum Wage) while on maternity leave. And those savings meant that Camilla would not be eligible for any remission of the tribunal fees. The evidence suggests that the introduction of Employment Tribunal (ET) fees has harmed access to justice and [that] since July 2013 many people are not able to enforce their employment rights. It is likely that other factors, such as the economic upturn and the introduction of Acas early conciliation have had some impact on the decline in the number of ET cases, but we are of the view that the impact of these factors is minor compared to the consequences of ET fees. Our members have told us that claimants with strong cases see the fee as a significant deterrent to pursuing a complaint. We also know of examples where respondents have refused to consider engaging in early conciliation or settling the matter before it reaches the tribunal because they wanted to “call the claimants bluff” on whether the employee would pay the fee. in ET cases”, and that “those most adversely affected [by the fees] are those on low incomes, women and those wishing to pursue a claim for race and/or sexual orientation discrimination”. the creation of such a barrier to justice is detrimental not only to those women who are denied justice, but also to the great majority of law-abiding employers – who are denied a level playing field – and to the public policy goal of eliminating gender inequality. These are important, long-term considerations that far outweigh any short-term financial benefit to the Ministry of Justice (in terms of net fee income, and lower operational costs due to reduced case numbers). Accordingly, we believe that abolition (or a very substantial reduction in the level) of the fees must now be a priority for ministers. The denial of access to justice on such a scale also matters if you believe – as we do – that law-abiding employers deserve a level-playing field on which to compete with their business rivals. The employment tribunal system is intended to ensure a more equal power relationship between the most vulnerable workers and their employers, without which – in the words of Winston Churchill more than a century ago – the good employer is undercut by the bad, and the bad employer is undercut by the worst. Largely as a result of the fees introduced in July 2013, the UK’s 1.2 million employers now risk facing a tribunal claim just once every 60 years, on average, and a private sector business just once every century. And that is simply a charter for Britain’s worst employers. In their November 2015 submission to the Inquiry, the Lay Members of the Employment Appeal Tribunal (EAT) concluded that “on the basis of the evidence now available, the introduction of tribunal fees has impacted adversely on access to justice in respect of the EAT”, and that “there is a strong case for the Government to reconsider the application of fees to the tribunal system”. In the interests of balance, it is only fair to note that, in their September 2015 submission to the Inquiry, Peninsula Business Services asserted that the fees introduced in July 2013 “do not pose a barrier to accessing justice, have served to deter the pursuit of speculative claims [and] have improved access to justice for all by helping to ensure that the tribunal’s resources are allocated effectively”. I imagine Gove and Vara will be going with Peninsula Business Services. Well, the evidence is overwhelming, isn’t it? This entry was posted in Justice and tagged Access to justice, Employment tribunals, ET fees. Bookmark the permalink.